Central bank of the country has a crucial role to maintain economic stability in the country. Let’s have a look some of the oldest central bank in the world. Central Bank of the country plays an important role in the development of the economy of the country. The Central bank of the country ensures financial stability in the country with many more promotional and development roles. 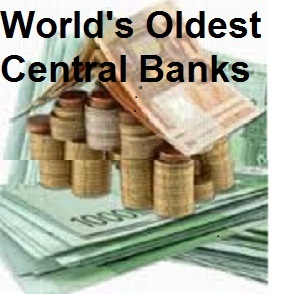 Here is the list of some oldest central banks of the world. Sveriges Riksbank, or the Riksbank: Sveriges Riksbank, or the Riksbank is the central bank of Sweden. It is world’s first or oldest central bank. It was founded in 1668 with 20 employees. The Bank work entails issuing currency, announce monetary policy and ensuring that payments in the economy can be made safely and efficiently. Bank of England: The Bank of England is United Kingdom’s Central Bank. The bank was established in the year 1694. The Bank was nationalised in 1946, is owned by the government of United Kingdom. The Parliament of the country has given powers to the bank through legislation, to maintain monetary and financial stability. Bank of Scotland: Scotland's first and oldest bank, Bank of Scotland was founded by an Act of the Scottish Parliament in 1695. The bank was set up mainly to develop trade in the country, mainly with England and the Low Countries. Later it was empowered by the Scottish parliament to issue currency in the country. Banco de España: The Banco de España is the national central bank of the Spain. It was established in the year 1782 by a Royal warrant King Carlos III. The bank joined the European Central Banking system in 1994. Banque de France: The Central bank of France, Banque de France founded in the year 1800. The bank is one of strongest pillar of the Eurosystem. Banque de France is the largest printer of euro bank notes and also plays a vital role to prepare and implement the decisions of European Central Bank (ECB). Bank of Finland: The Bank of Finland is the sole monetary authority and the central bank of Finland. It is the world’s fourth oldest national central bank. The bank was established in the year 1819. 7. De Nederlandsche Bank (DNB): The central Bank of Netherland, De Nederlandsche Bank (DNB) is responsible to safeguard financial stability in the country. The bank was established in 1814 by a charter issued by King William I. Now, DNB operates under the provisions of the 1998 Bank Act, the Financial Supervision Act, the Dutch Civil Code, DNB's articles of association and the rules of procedure. It is an independent public body with a national mandate for supervision, resolution and the deposit guarantee scheme. The bank is part of the European System of Central Banks (ESCB) and the Eurosystem, and cooperates with its European counterparts in the areas of monetary policy, foreign exchange operations etc. 8. Norges Bank: Norges Bank is Norway's central bank, founded in the year 1816. Norges Bank's activities are regulated by the Act of 24 May 1985 relating to Norges Bank and the Monetary System etc. The bank is accountable to promote economic stability in the country. 9. Oesterreichische Nationalbank (OeNB): The central bank of the Republic of Austria named the Oesterreichische Nationalbank (OeNB) was founded in 1816. Now the bank is an integral part of the European System of Central Banks (ESCB). The OeNB contributes, in the public interest, to monetary and economic policy decision-making in Austria and the euro area. 10. Danmarks NationalBank: The bank was established in 1818. However the bank’s independence was incorporated into Danmarks NationalBank Act from 1936, when the bank is solely responsible for determining monetary policy in the country. The bank's three main objectives are to contribute to ensuring stable prices, safe payments and a stable financial system. 7 Banking Exams in 2017 You Can't Afford to Miss! # when was the first central bank in the world established?